The Most Reverend and Right Honourable Justin Welby Archbishop of Canterbury, in partnership with the Naz Legacy Foundation organised an Interfaith Iftar hosted at the Lambeth Palace on Monday the 27th of June 2016. Speakers included The Archbishop of Canterbury, Cheif Rabbi and the Mayor of London, Sadiq Khan. The event empowered and raised the aspirations of 100 young people aged 18-25 years old (the average age was 21! ), representing all 32 boroughs of London, from all faiths and none and provied wonderful opportunity to celebrate faith in the centre of our vibrant and diverse capital. 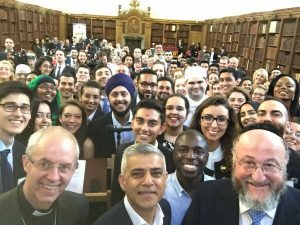 The young people came together to discuss how they best thought they could bring faith and non faith communities together in London for the betterment of all our communities – and a number of them are now putting plans together to implement their ideas. Amersi Foundation, Dorfman Foundation, Sayed Bukhari Foundation and Pears Foundation.